Several years back, roaming the aisles of Whole Foods, I discovered their equivalent house brand. 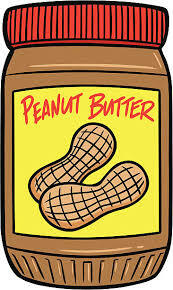 Simply called 365 Peanut Butter Crunchy. Dry Roasted Peanuts, Salt. Separation is, if you recall, natural. So, during those years when I switched brands — before the purchase added to the Jeff Bezos National Enquirer Investigation fund — I would be required to stir when opening a new jar. Truth is, before opening and stirring that new jar of Smuckers that recent a.m., as mentioned in my lede, I had opened and stirred a jar of 365. I like the combo of the two better than either individually. The pairing provides the added moisture of the 365 with the more resonant flavor of the Smuckers. I also I realized just feel compelled to blend. It’s what I’m prone to do. Back in The Day, when I lived a more profligate lifestyle, I had this really groovy, hand-crafted wooden box, with a beautifully designed top that snapped shut, with an embedded silver aeroplane on it. It wasn’t big, this lovely little box I purchased at a long deceased head shoppe. It could contain, oh, perhaps a fifth of an ounce of content. Which content was forever and always during my ownership, illegal herbs. More specifically and germane, a blend of illegal herbs. Nothing said this guy is a stylin’ hipster more than showing up somewhere among friends and new acquaintances, with the latest LPs from some yet discovered bands under arm. Then pulling out for display ooohs and aahs and anticipation, this lovely little container. Opening it with a dramatic flourish so the aroma of the blended finest from Hawaii and South America and the South Seas would fill the room. Operative word for our purposes here: Blended. In the day, I took a holiday in Maui, and there purchased a bud of such size — at least a foot long — that I dared transport it back in the length of my sportcoat arm, so as to be able to cherish the look on my pals’ eyes when I unveiled it in its entirety. The smoke was righteous. Only to be greeted on my return by a runnin’ partner, who had scored some incredible smoke, grown in the exotic climes of southern Indiana. I was, to use a word that had a totally different meaning back then, trumped. But . . . when I blended the two and offered a try from that magic box, well, let’s just say, the room was mine. In the early 80s, when I cleaned up my act for good, at least so far, I passed that box along. But the blended memories linger still. For years, for my morning coffee, I drank Paradiso Blend from Gloria Jean’s. Purchasing it first from a company franchise in a local mall. Later, after that shut its doors, online in ten pound bulk purchases. It was a boffo blend, roasted to a “second cracking” or so advised the coffee expert who first exposed me to it. Everyone who tasted it remarked about its taste. Then Gloria Jean, not so G L O R I A, stopped offering it. Requests to her for an explanation as to the discontinuance went unanswered. So, for the last ten or fifteen years, however long it has been, I’ve been blending my own. Never the same. Always with a French Roast, and a light roast from some island somewhere, and some from an exotic mountainside where the pickers wash each bean by hand. (OK, that’s hyperbole, literary license.) Like say, Mandehling from Sumatra, along with Java Love Organic, which is kind of the coffee equivalent of a glue guy on your favorite hoops squad, and some Peets’ Dark Roast. The combination is never the same. The combination is always a blend. Duh. Most times it works. Every once in awhile, the beans aren’t so complimentary. Only on the rarest of occasions has it matched Gloria Jean’s concoction, damn her soul for cutting off a supply of my fave blend. My name is c d kaplan, and I’m a compulsive blender. You had me on exotic climes of Southern Indiana…I’m betting Sellersburg..
That is quite an introspective observation. And I thought I was the rarity, I always blend coffee and eat apples with Smuckers. I blend my coffee beans. I guess I’ll have to start blending the PB. Thanks for the insight.